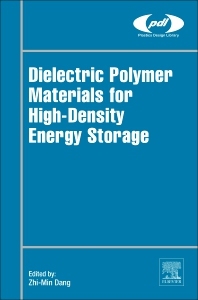 Dielectric Polymer Materials for High-Density Energy Storage begins by introducing the fundamentals and basic theories on the dielectric behavior of material. It then discusses key issues on the design and preparation of dielectric polymer materials with strong energy storage properties, including their characterization, properties and manipulation. The latest methods, techniques and applications are explained in detail regarding this rapidly developing area. The book will support the work of academic researchers and graduate students, as well as engineers and materials scientists working in industrial research and development. In addition, it will be highly valuable to those directly involved in the fabrication of capacitors in industry, and to researchers across the areas of materials science, polymer science, materials chemistry, and nanomaterials. Zhi-Min Dang is a Professor in the Department of Electrical Engineering, at Tsinghua University, Beijing, China. Prof. Dang previously worked as Professor at the Beijing University of Chemical Technology and the University of Science & Technology Beijing. His main research interests are in the fields of dielectric polymer materials and electrical insulation. Prof. Dang has published over 200 peer-reviewed journal papers.